For more tips on creating with the Butterfly Dreams collection, watch the tutorial at https://youtu.be/uCKKJfAQFHA. Instructions: Create a 6" x 6" card base out of white card stock. Cut a 6" x 6" card front from the Butterfly Dreams Paper Collection and sponge edge of card front with Teal Zeal Memento Ink. Adhere 6" x 6" card front directly to card base with Dries Clear Adhesive. On White Cardstock with Opera Pink VersaMark Ink stamp the petals from the Small Sweet Peony Cling Stamp Set and stamp the small peony blossom from the Peony Bud and Blossom Cling Stamp Set. On White Cardstock with Leaf Green Ranger Archival Ink stamp the leaves from the Small Sweet Peony Cling Stamp Set; with Rose Bud Memento Ink stamp the butterfly from the Fluttering Butterfly Cling Stamp Set; and using Nautical Blue Memento Ink stamp the butterfly floral image from the Butterfly Dreams Border Cling Stamp Set. Cut all with coordinating dies. Using the Stack and Store Daubers color the leaves using New Sprout; color the peonies with Tangelo and Cantaloupe Memento Inks; color the large butterfly wings with Cantaloupe Memento Ink and add Angel Pink Memento Ink to the body; to color the small butterfly floral image use Danube Blue and Teal Zeal Memento Inks on the butterfly, New Sprout and Bamboo Leaves Memento Inks on the swirls and Rose Bud and Cantaloupe Inks on the flowers. Use the Deluxe Flower Shaping Kit to shape all. 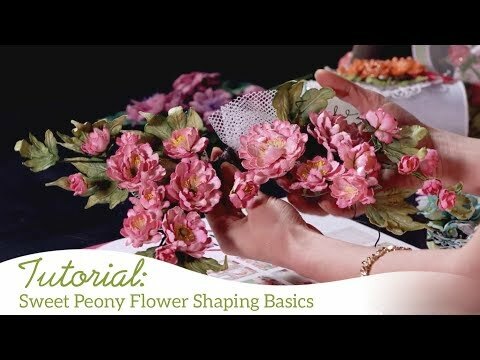 Assemble the peony as shown using hot glue gun and adhere to peony and leaves to card. Cut butterfly floral image and adhere it and large butterfly to card front with Dries Clear Adhesive. With Dries Clear Adhesive add Pink Azalea Glitter to the large butterfly, to the die cut peony and the peonies on the design paper; Lettuce Glitter to the die cut leaves and swirls and leaves on the design paper and Blue Rain Glitter to all the blue butterflies. With Dries Clear Adhesive add Sunshine Yellow Flower Soft to the flowers on the die cut and Go Man Go Prills to the center of the peony, as shown. Finally adhere the Turquoise and Orange Rhinestones to the upper right hand corner as shown.